For those about to take drums a little more serious, you’ll want to invest in a higher quality drum set. So, what makes a good drum set? We will go over that and some of the best professional drum sets on the market today. Let’s discuss a few things you should look for in a professional drum set. The feeling of holding a pair of sticks while hitting a drum set and producing a beautiful rhythm is simply amazing. To experience that, you must graduate from a beginner set best used for practicing and developing your initial skills to one that will allow you to advance. We can say with certainty that a low-quality drum set will never be able to offer the same sound that professional drum sets would possibly offer. One of the biggest differences between low-quality drum sets and high-quality ones is the materials used to make them. High-quality drum sets are made with a very specific wood type, have a set number of plies, better supportive hardware, and are manufactured very differently. For those who intend to take drumming a bit more seriously, we highly suggest that you only invest in a high-quality drum set. 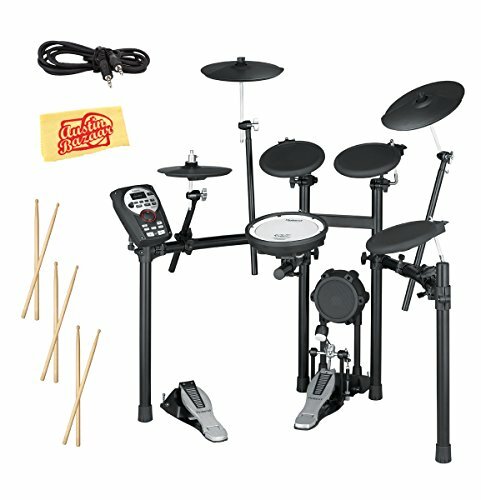 What Should I Look for When Buying a Better Drum Set? 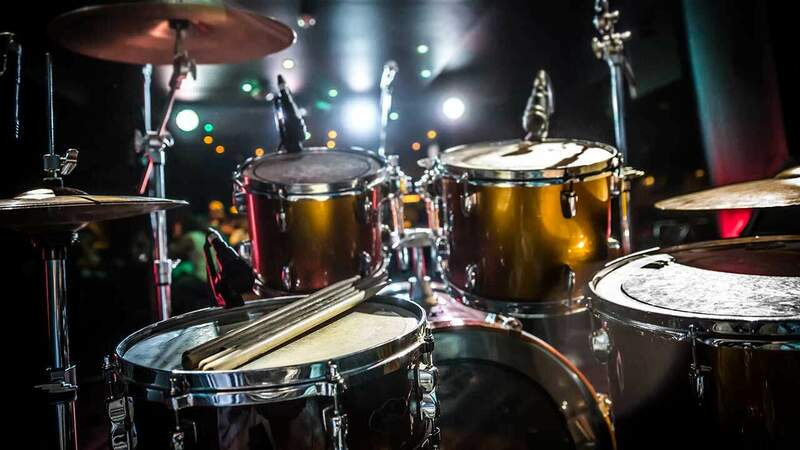 Discussed below are the key features that will help you choose the best professional drum set that fits both your budget, and your personal style. One of the biggest influences that will help you decide on the best drum set for you is the type of music you want to produce. Each type of drum set can produce a different sound. For instance, if you want to play blues, you’ll need a different drum set than if you were trying to play heavy metal. To explain this a bit deeper, you should specifically be looking at drum heads. This part of the drum is responsible for the type of sound that is produced. Thicker skinned heads will result in a deeper sound. If you are one of the individuals who play multiple music genres, then we highly recommend you choose the maple drum set as this is guaranteed to be the most versatile amongst all kinds of drum sets. The next best option after that is Birch. For folks who are into heavy rock, Tama drums are an ideal choice. 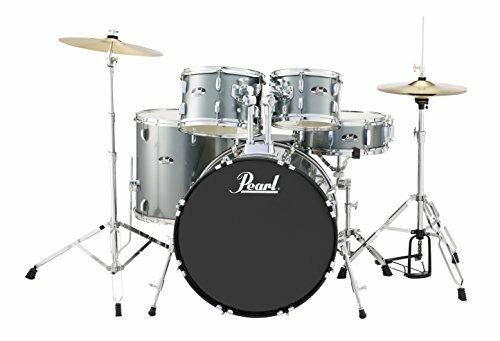 Though a little more expensive, many heavy rock drummers endorse this brand since they manufacture drums that have the perfect blend of looks and sound. If you’re in search for a versatile snare, the best option is a maple snare with a 5.5-inch depth. The tuning range on this is simply fantastic, and the tone blends well with any music type. On the other hand, metal snares tend to get too loud to the point that the sound is too piercing, especially if the drummer isn’t experienced yet. Having said that, none of these are considered standard rules because what you should be thinking of is what kind of sound is best for you and your band. This means that, on paper, it may not be an ideal choice for your genre, yet it may work wonders for your band. Thus, it is best to play a number of drums and do thorough research before making your final buying decision. It is quite a known fact that drum sets are not too cheap, and adding more pieces will cost you more. Nonetheless, there are quite a few drum sets that will work well for you and will not exceed your budget. However, if you are specifically searching for an instrument that will last you for quite a number of years and provide you with an exceptionally high-quality sound, then you may have to go for the expensive and well-known brands. This is crucial depending on the type of music you want to produce as well. The higher number of pieces in your drum set can make it possible for you to do more things. Apart from the number, looking at what is included in the set is also critical. Some drum sets only come with the shells (drums). Others provide you with hardware and cymbals to make a complete set. One thing to keep in mind when buying a drum set that includes hardware is the quality of the hardware. If you have high-quality shells, but bad hardware, your set will not work as best as it can because it is the one that supports the shells. Drum sets come in several pieces ranging from three to eight, but the standard is about five. The number of pieces that would work best for you would depend on your level of experience. You must also note that it is also vital to understand that if you buy a three-piece drum set, it does not mean that you cannot add additional pieces to it in the future. Hence, it is advisable that as you get better through continued practice that improves your drumming versatility, you can add extra pieces to your set. Back in the day, drums were thinner and unstable. With wide changes in temperature, they would tend to flex and lose their shape. In addition, they were not able to produce a sound that has the right and consistent tune quality because, technically speaking, what affects the projection of sound is the thickness of the ply. Therefore, you should always opt for plies that are thick. When it comes to the ideal number of plies, the toms should have eight plies while the snare drums should have eight or ten plies. On the other hand, the bass drum should have a minimum of ten plies. Going more into what type of music you’ll be playing, you should know how the size of each drum affects this. For those who like heavy music, having two bass drums and seven toms is recommended to fulfill your thunderous desires. However, for jazz, you will want something more restrained such as a modest 18-inch bass drum. When looking over drum sets, pay close attention to the type of drums in the set as well as the size. The raw materials that make up the shells are critical since they contribute not just to the durability of the instrument but also to the quality of the sound produced. Some drums are made of mere metal, and they should be your second option. A good acoustic drum set usually has a base that is made out of high-quality, seven-ply maple wood. Likewise, the stands and the mounting systems should also be made of solid and sturdy materials. When you start shopping for a drum set, you will find that the shells are finished using three different materials namely: wrap, satin, and lacquer. A shell that is finished with a wrap coat can enhance the sound, but most non-musicians would not be able to identify the difference because the changes are very minute. For a better quality set, we suggest you go with a drum set that has been finished with satin. This kind of finishing will allow the drum to vibrate and resonate freely once hit by a drumstick, giving it a lovely sound. What Should I Consider When Choosing the Brand of a Drum? Once you’ve determined the type of drum set that you need, you must also decide what brand you should go for. Of course, drum set brands come in different price ranges. You must take note though that if you are an absolute newbie, selecting a drum from a premium brand even if you can afford it may not always be an ideal choice. You should be 100% certain that you will pursue drumming as a career or lifetime hobby. If not, you would just be left with a costly piece of musical equipment. Another thing to consider is that some brands are popular and expensive because of the look of their drum sets, and these good-looking drums can have either great or poor sound quality. In general, if the product looks great, a significant amount of the purchase price is going towards cosmetics. Thus, in this situation, expensive does not always equate to quality. Also, if the brand produces and sells multiple kinds of musical instruments, you must not assume that the quality of their guitars or pianos will be at par with the drum sets. So, what are we trying to imply here? The brand of the drum set is not always the number one consideration. 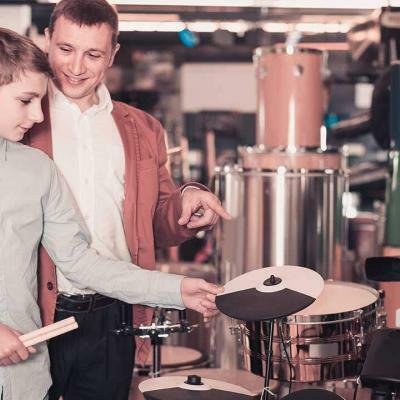 What matters most is that you should spend time playing different drum set brands to help you understand which manufacturer and model is perfect for you. Apart from the points mentioned above, here are more tips that can help you when you’re deciding which drum set to purchase. Try to research or ask the recommendations of professional drummers, drumming teachers, band members, and music store employees. Take a look at online videos and read articles that talk about certain drum set brands and models. Seek the opinion of a person who owns that particular drum set you are interested. If he or she is your relative or friend, you can ask them to play it so that you can hear and evaluate the sound quality. Pearl is a brand that offers affordable drum set models and has a high user-satisfaction rating, making them a popular choice amongst musicians. Even though these are easy on the pockets, they are on par with several high-end brands. The Pearl Roadshow Drum Set is ready straight out of the box. With 9 ply poplar, 7mm shells, you can expect to receive a highly durable drum set. The drums included are 22×16 bass drum, 16×16 floor tom, 1×8 tom, 12×9 tom, and 14×5.5 snare drum. This is a complete set, so you can expect to get a double-braced cymbal, hi-hat, and snare stands along with this set. You also get a stick bag, sticks, and a poster! It is a great set for both beginners and professionals. Pearl Roadshow is great for dedicated practice and honing your skills. Established in 1999, Pacific Drums and Percussion, more commonly called PDP, is a division company of Drum Workshop (DW). They are known to offer affordable drum sets that have a quality which is as close as possible to the high-end drums produced by the main company, DW. They have drum sets for both experienced and novice musicians. 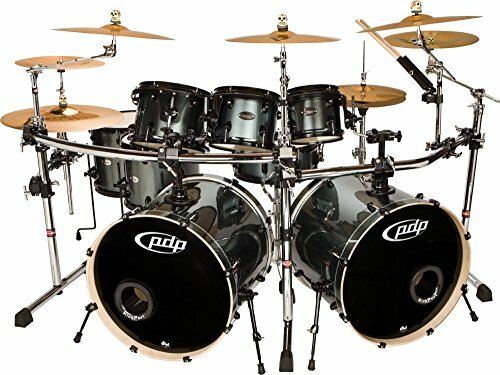 This PDP Drum Set by DW offers a complete 8-piece drum set for the most serious professional drummers. It comes with 22×18 bass drums, 8×7, 10×8, and 12×9 toms, 14×12 and 16×14 floor toms, and 14 x 5.5 snares. It does not come with cymbals, but you can expect a very nice poplar shell. Poplar shells are nice because they offer a balance of punch and sustain. The heads are Remo and have attractive hoops and lugs. The toms can be arranged from right to left if you are left-handed. Gammon is a relatively small, family-owned and operated company known for their drums that are very aesthetically pleasing but are not supremely flashy. Also, they are built quite well and deliver a solid performance; all these at an affordable price. Granted, this is a relatively new drum set manufacturer compared to our other models, but our research showed an extraordinary amount of positive reviews. Hence we felt it deserved a mention here. Gammon offers a full sized 5-piece drum set that includes a hi-hat, crash cymbals, sticks, a stool, and the stand. Unlike most drum sets, this one is complete. If you are a looking to get everything in one go, Gammon wants to give it to you. 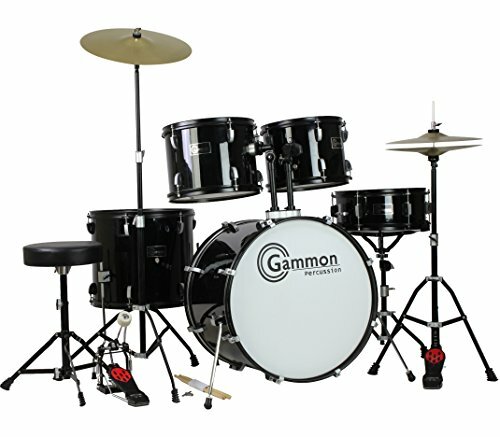 With a beautiful high gloss black finish and chain drive pedals, it is hard to go wrong with Gammon Percussions drum set. It is also very price friendly when compared to other drum sets with similar features. The 5 drums included are snare drum, bass drum, two mounted toms, and a floor tom. To make things even greater, Gammon also has replacement parts for each part of their drum set. This makes the getting high-quality drum kit support much easier. 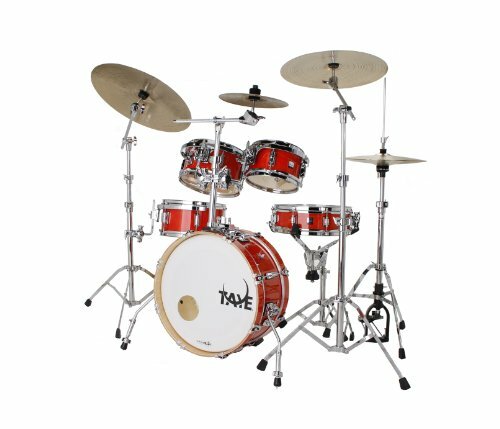 Taye Drums is a company that has been around since 1975. They take pride in the quality of their products because all parts, from the smallest to the largest, have been crafted and inspected by their experts. They have also created innovative solutions so that drummers can replace parts of their drum sets with lesser time and energy. an add-on boom cymbal arm. The package comes shipped in three separate boxes, and together with the drums, would weigh about 24 pounds. The Taye Drums GoKit has heavy-gauge metal parts that are plated with a perfect shade of chrome. All the hinges, threads and several other moving and adjustable parts are easy to handle; thus, assembling and disassembling will not be much of a hassle. The shells have a mirror-like coat that further enhances the look of the set. Inside these shells, the parts are flawlessly finished with satin. Additionally, the bearing edges have been sanded very smoothly and uniformly. They have an angle measurement of 45 degrees and are equipped with a round cover. 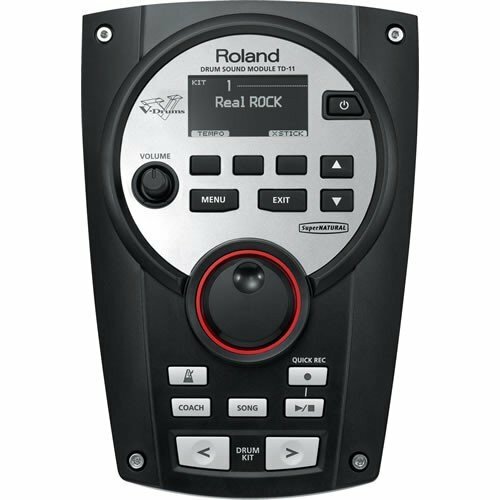 Roland Corporation is a Japanese company that started manufacturing and distributing musical instruments in 1970. They are also well-known for their quality digital recording equipment. 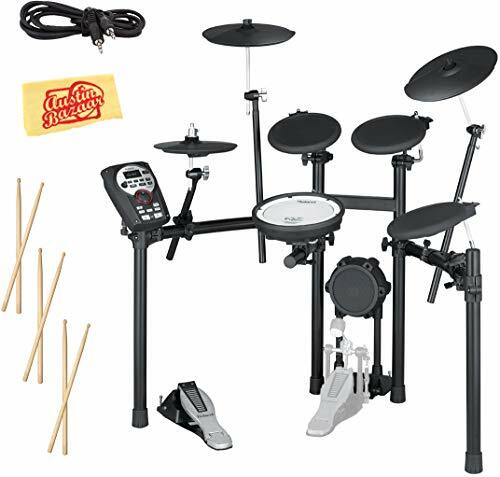 As they continue to innovate and try to meet the growing needs of the public, they now offer a wide variety of electronic drum sets and percussions, and one of which is the TD-11K model. The Roland TD-11K Electronic Drum Set has an overall width of 1200 mm, a height of 1250 mm, and depth of 1100 mm. Approximately, the total weight is at 22 kilograms. It is equipped with a large LCD screen that has an icon-driven user interface. Also, it has a USB function that will enable you to connect it to your computer for you to save, in WAV or MP3 format, and playback the sound you played on the drums. This drum set’s CY-5 cymbal pad has a hi-hat that is integrated with a 10 inches playing zone. This will also give a swing movement that is natural and a bow and edge triggering that is separated. What is more interesting is that the manufacturer included an FD-8 model Hi-Hat Controller that will provide drummers an authentic hi-hat sound as well as the ability to transition from open to closed positions smoothly. The snare drum that comes with this set has a patented dual-triggering technology called PDX-8 mesh V-Pad. With this, there would be a balanced and accurate sensing between the rim and the head. Since the rim measures 10 inches, the resulting rim shots would be comfortable to the ears and noiseless. On the other hand, the toms are made of a durable, time-tested, 8.5 inches PD-8A rubber pad which gives a highly accurate triggering. To further enhance the drum set’s performance, the bass drum’s head is loaded with new mechanics and is cloth-designed. Additionally, the KD-9 dual kicking pads or pedals are designed to provide the user with comfortable usage, great feel, and solid playability. This also gives out a dynamic response and an accurate triggering. This drum set also has a SuperNATURAL-powered Sound Module for a solid performance and enhanced playability. This also ensures that the sound produced by the drum set is natural and expressive. It has Quick Record or Quick Play and data storage functions. In addition, it also has a COACH mode that you can use if you are trying to improve your drumming skills or is just starting to play the drums. Upon purchase, you will get three drumsticks, an audio cable, a polishing cloth, and a user’s manual. In case you are from the USA, you would also get an MDS-4V drum stand, which has a V-Compact and space-saving design. 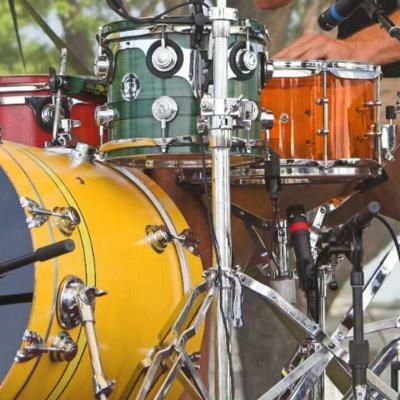 Out of the drum sets reviewed on our list, Pearl Roadshow offers the best value. It is great for both beginners and professionals. This is great because you may not be sure of your current expertise level. This will ensure that you do not get a drum set that you cannot handle. It also comes with much more accessories than PDP’s shell set. Not having to pay for the hardware will save you money down the road. This also allows for you to get started playing as soon as your drum set arrives. The size of the drums included in the set gives you plenty of options to choose from in the type of sound you want to produce.